Today's cool but slightly horrifying vision of the future comes courtesy of Yourbot, which is a combination of a digital time capsule and man's search for immortality. 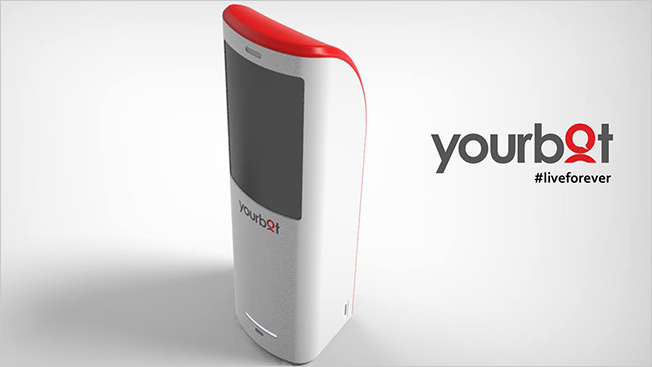 Yourbot is a service that creates a psychological profile of you, then uses photos of you to create a 3-D digital avatar that can be shared with your descendants after you pass on, fully capable of communicating your memories and personal anecdotes such as your first kiss. While users will primarily interact with Yourbot on the Web or via a mobile app, the creators are also developing a voice-activated device featuring your interactive avatar. The device will only be available to Kickstarter backers.